As I understand it, The Feast of Seven Fishes – a meal that consists of seven different types of seafood dishes – originated in Southern Italy as part of the Roman-Catholic tradition to abstain from meat during holy days. Typically, this meal is served on Christmas Eve, because every good Italian knows it is all about food from December 1st to whenever the Christmas Day leftovers hold out. Popular choices include linguine with clam or lobster sauce, salt cod, octopus salad, salt-crusted whole fish, scallops, crab stuffed mushrooms, eel, and fried calamari (see below). This year, I’m going to cook up my own seven fishes over the Christmas season, and hopefully work up to making them all on Christmas Eve some year. Voila! Thaw calamari and pat dry. Prepare two plates: one with flour, salt and pepper, another lined with paper towels. Heat oil in deep skillet on high until a drop of water spits on the top. 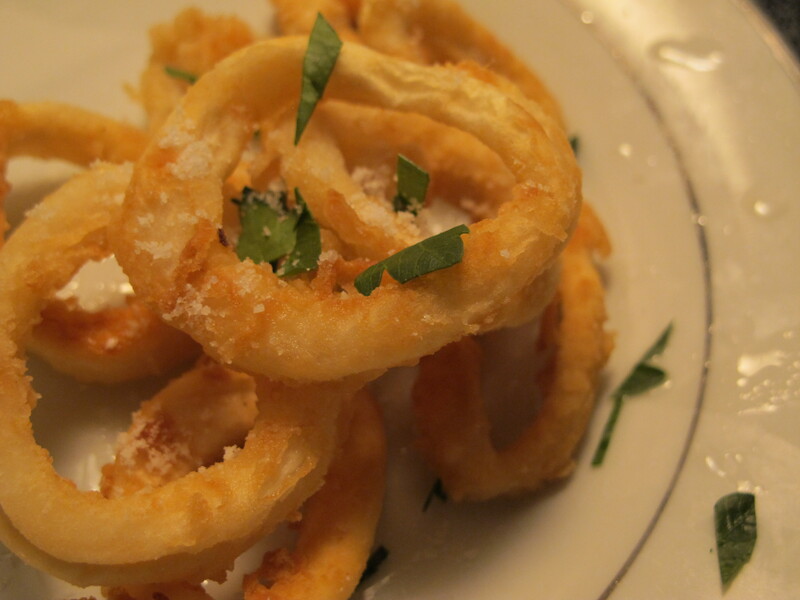 Roll plain calamari in flour mixture, divide in half- you will cook in two batches. Put half into oil and cook for 3-4 minutes or until golden brown. Remove and drain on paper toweled plate. Cook second batch, drain. Sprinkle with more salt, lemon juice, and parsley. Eat plain or dip in aioli, ketchup, etc. Voila.